Valentine’s Day can be a joyous and romantic day filled with flowers, chocolates, jewelry, conversational hearts and teddy bears from your loved one. But it can also be difficult for singles, as it can serve as a reminder of love lost, relationships gone sour, or loved ones who have passed away. Some singles feel it’s a reflection of them not being “enough” if they aren’t in a relationship with a significant other. So, can we just skip right from February 13th to the 15th this year? Valentine’s Day doesn’t have to be disappointing when you’re single. Instead, Valentine’s Day can be a time of celebration for yourself. 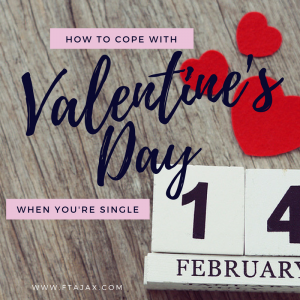 Recently, an article was published that chronicles a bit of the history of Valentine’s Day and gives some ways to cope if you’re single. Below is the summary of this article and a few additions that may make it easier to enjoy February 14th this year. Money: Think of the money you will have saved in not having to buy a gift or plan an elaborate date night for someone! Spoil Yourself: Enjoy some of your favorite things, plan activities to pamper you and show yourself some love. Celebrate You: Take a moment and celebrate the successes that you have achieved in your life, both big and small! Throw a Party: Invite all your single friends and celebrate the wonderful world of single-hood. Buy your own gift: Purchase something special that you have had your eye on for a while. This will give you something to look forward to instead of getting wrapped up in the hype of Valentine’s Day. Get a make-over: A change in hairstyle or trying something new with your make-up or nails can make you feel better about the wonderful person you are. Start a new project: Whether it be a home improvement project, DIY craft project or picking up a new book that you have been waiting to read. Starting something new will make you feel rejuvenated. Re-evaluate your goals: Remind yourself of where you want to go and what you want to achieve in life. Relationships take time and effort and now is a great time to focus on achieving your goals. It is a Day of Love: LOVE, it’s not just for couples! Call a friend, go visit an elderly family member, do a random act of kindness or show co-workers how much you care about them. Love is a beautiful gift and the world would be a much better place if we could celebrate love even in the smallest of ways. Help those in need: This is another wonderful way to help spread the love! Donate clothes, volunteer at a soup kitchen, volunteer at a hospital, the options are unlimited. Exercise: This is a great way to show some more love to yourself. Exercise increases endorphins which helps to improve your mood. It is also a great way to enjoy the outdoors by going for a walk. Meditate: Take the time to meditate or pray. During the great expectations of Valentine’s Day this helps to keep us grounded, calm and at peace. Try something new: Try a new kind of food. Maybe take an art class. Sign up for an exercise class you’ve never taken before. Anything that gets you out of your comfort zone can be exhilarating. The possibilities are endless. Keep it all in perspective: Today is a day like any other. Keep your priorities in line and do things today, just like hopefully every other day that bring you joy, happiness and fulfillment! Remember that you are valuable and significant, regardless of your relationship status. If you struggle to love yourself and see your own personal value, consider individual counseling. What are ways you’ve coped with Valentine’s Day while being single? We’d love to hear your thoughts.